Montessori Toddler House Nursery Bedding. The bumpers features a chevron pattern, adding a touch of delicacy to your baby’s room! Note: cushions are sold separately, not in this set. The Montessori Method is the result of scientific and empirical research developed by the physician and pedagogue Maria Montessori. For the baby’s room become a functional environment that stimulates creativity and autonomy, it is important to create an environment full of colors and shapes, where everything is within the reach of children. It is made of 100% cotton (filling 100% polyester). 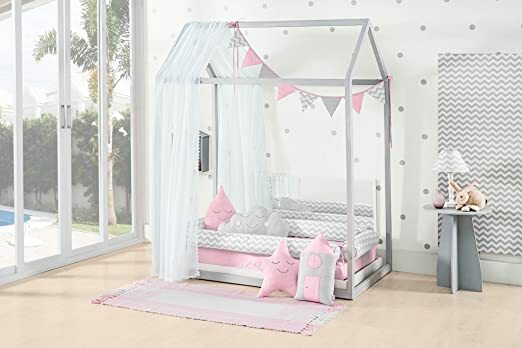 With a beautiful design, this crib set is soft, comfortable and can match with toddler house bed.